The Greater Boston Convention & Visitors Bureau (GBCVB) has taken its China marketing initiative to a new level. The Bureau has officially launched a WeChat account, making Boston just the 4th destination in the United States to have a verified WeChat account associated with a convention and visitors bureau. In China, WeChat alone is the equivalent of Facebook, Instagram, Amazon, Google, and Trip Advisor combined. WeChat boasts over 900 million users and it is the primary channel that the Chinese use to converse, refer, transact, and share experiences. “With over 21,000 Chinese college students in Boston and Massachusetts, and with more than 242,000 visitors from China coming to Boston in 2016, making China Boston’s #1 overseas source market, the WeChat launch is our next major initiative that’s underway to insure we reach our target of 500,000 Chinese visitors by 2021,” said GBCVB President & CEO Pat Moscaritolo. China 2.0 was the second China-Friendly workshop hosted by the GBCVB, and this year’s program focused on the importance of WeChat and WeChat Pay. The GBCVB worked with Tencent, WeChat’s parent company, to organize the presentations and panel discussions. 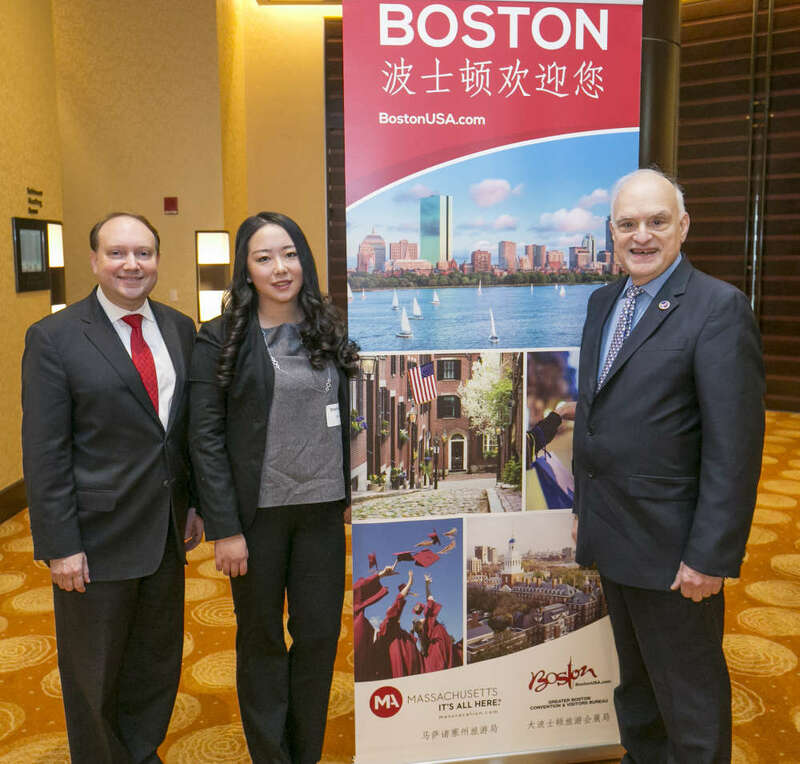 The program included presentations on the exponential growth of Chinese visitors to Boston since Boston gained nonstop service from China in 2014. The Bureau brought in Eagle Yi, Tencent’s Director of WeChat Pay and WeChat Marketing, to present on the world of WeChat and how vital it is to communication and commerce in China. Two panel discussions followed, with Jeff Fish, Co-Founder of The Momentum Group, Bruce Bommarito, VP of International Marketing at Caesars Entertainment, Denny Xia, General Manager of East West Marketing, and Kathryn Green, Marketing Director at Saks Fifth Avenue, all contributing to a robust conversation. The Bureau also teleconferenced in from Shanghai Christina Li, Director of Marketing, China, for American Express. According to Moscaritolo, “China is the most powerful source of change on the planet for our visitior industry,” and he provided insight into why the Bureau has pursued this market and positioned Boston as an attractive destination for Chinese visitors with a goal of reaching 500,000 Chinese visitors by 2021. The GBCVB has hired Sharon Xu as its Chinese Marketing Manager to oversee its WeChat programming, and the Bureau will work with Tencent on a specific subset within WeChat to designate Bureau members that are certified as “China-Friendly.” In January 2018 the Bureau will be rolling out a comprehensive Chinese marketing services program for its member companies looking to generate business from Chinese visitors. Gaining exposure on the Bureau’s WeChat account will be a primary component of the marketing services project.